In a 2 Ltr cooker add water, salt and oil. Cook for a whistle. Switch off. Release pressure immediately and first add rava followed by ragi flour. Mix thoroughly and keep it covered with weight on. Mix the stuffing ingredients and make a coarse powder using the small mixie jar. After 15 minutes, open the cooker and knead the dough. Divide into 6 equal portions. Roll out small discs. Grease the gujiya mould, place the discs. Fill one side with 2 tbsp of the stuffing. Wet the corners, seal the edges by closing the mould to form the shape. Make sure, the ends are sealed properly. Heat oil in a pan and fry them one by one by flipping sides a few times.. Once half done, remove and repeat the same for others. After all the gujiyas are half fried, drop the first one again and cook till it is completely fried. Drain on a kitchen tissue to remove the excess oil. 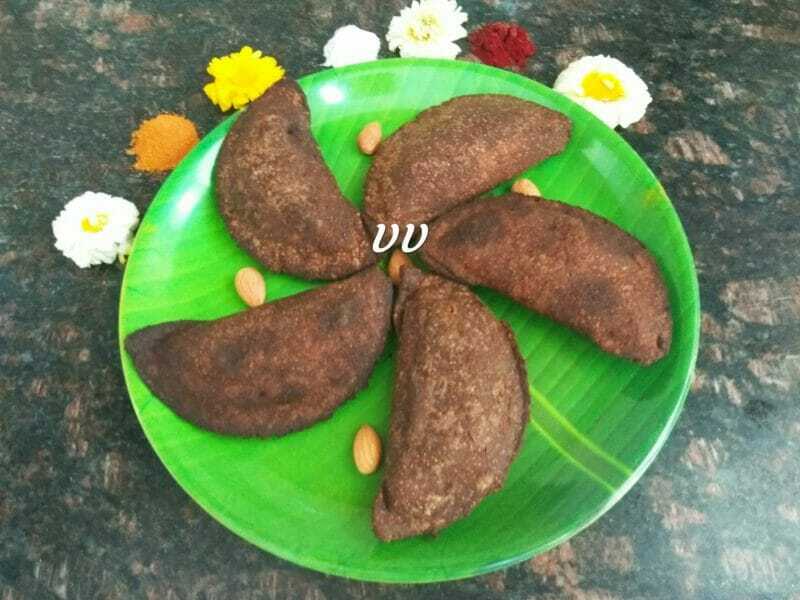 Tasty, healthy low calorie gujiyas are ready! Water quantity varies with the moisture content of the flour. So, add water accordingly. Adding a tbsp of rava helps the gujiyas to retain the shape. If you want to make them completely gluten free, use rice flour. Khoya and nuts can also be used for stuffing.